The charity sector is unlikely to experience an increase in donations or income from the government over the next few years, the National Council for Voluntary Organisations has warned. 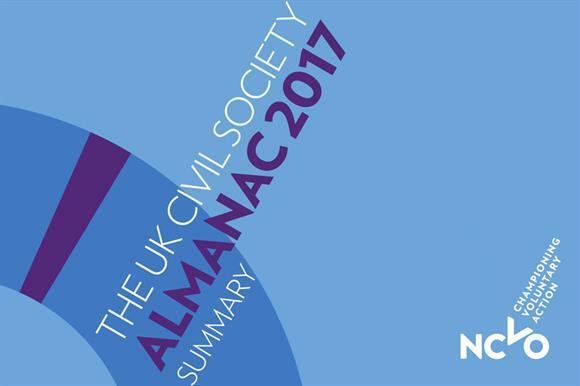 The umbrella body made the prediction alongside the release today of its UK Civil Society Almanac 2017, which covers the 2014/15 financial year and is based on analysis of financial data from a sample of more than 7,800 charities. The NCVO said earned income was the best prospect for future growth and that money from dormant assets, such as shares or bonds, should be used to help local charities. The almanac shows that the sector’s overall income totalled £45.5bn in 2014/15, a rise of £1.7bn on the previous year. It says that 90 per cent of the sector’s £112.7bn of total assets – such as property, cash and investments – are held by just 3 per cent of charities, with the top 100 asset owners accounting for half of the sector’s total. It says the vast majority of charities "have little reserves to speak of", which it describes as a "long-standing challenge". The biggest rise in income in the sector in 2014/15 was from individual members of the public, from whom £20.6bn was raised. And, although income from government grew, grants made up only 19 per cent of the money charities received from government. The total £15.3bn the sector received from government amounted to approximately 2 per cent of total government spending. There was also a 16 per cent fall in income from the private sector, the almanac says. London-based charities accounted for £18.9bn of the sector’s income. In comparison, north-east England accounted for only £900m of charities’ combined income. Approximately 48 per cent of all charities are described as "micro", defined as those with annual incomes of less than £10,000, the almanac says. Another 34 per cent it categorises as "small", with annual incomes of between £10,000 and £100,000. In contrast, only 0.03 per cent of charities are deemed to be "super-major", those with incomes of more than £100m. Charities with incomes of £1m or more a year accounted for only 3 per cent of the total number of charities that year. A total of 853,000 people worked for general charities that year, the almanac says, and the sector contributed £12.2bn to the UK economy in 2014/15, the equivalent of the economy of Cyprus. Spending on charitable activities accounted for 84 per cent of total spending in the sector. The almanac says that 14 million people volunteered at least once a month that year, with the highest rate in the 16 to 25-year-old group. Sir Stuart Etherington, chief executive of the NCVO, said: "Charities have been becoming increasingly entrepreneurial in recent times. With no realistic prospect of an overall increase in government spending and what look to be tough public fundraising conditions, this is a trend that will have to continue if the sector is to see growth in the next few years. "While some charities will doubtless buck these trends, the picture for small and medium-sized charities in particular looks challenging. "The next government could boost local charities and community groups for a generation by using the money from dormant assets to endow community foundations with investment that can generate returns to support charities for a generation to come. They could also help communities buy assets that are important to them, putting them under the control of local people through charities and community groups."